You will love SOI’s meeting room hire benefits. If you have a home office but meet with clients on a regular or ad-hoc basis you will know scrambling to find a suitable meeting location gets old very quickly. Hiring a professional meeting room is also a great option if you are conducting training sessions or even prospective employee interviews. Remember, meeting rooms can be used for so much more than just a standard meeting. It doesn’t matter if you are just starting up or have been operating for a number of years. Having the use of a professional meeting room is not only convenient but will enhance your professional image. How your business is portrayed by prospective new clients as well as current ones is very important. Even if you have a commercial office space already, hiring an off-site meeting room can have its benefits. Whether you want to avoid the distractions of being “in” the office or you need more space. There’s nothing worse than being crammed into space not quite big enough and trying to participate in a training session or meeting all day. Plus, booking your meeting room with SOI couldn’t be easier! We have just launched our online booking portal giving you the ability to check availability and choose the right room for you. If you hire an SOI meeting room then all your clients and guests will be greeted by our professional and friendly receptionists. Your guests don’t even have to know that you aren’t a permanent tenant of SOI. We will wow your guests before they even see you with our professional atmosphere and attention to detail. When using our SOI meeting rooms you will also have the support of our dedicated staff. Another benefit is having very fast wifi access as well as on-site IT support, should you need it. We take pride in having the latest technology and support to make running your meetings or training sessions as easy as can be. Plus, we also have flip charts, whiteboards and TV screens available to assist you with your presentation or training sessions. Do you have a meeting that will run over lunch or do you have a training session you are conducting over the course of a full day? How beneficial would it be to have access to catering options that can be delivered to your meeting room? We can also offer morning and afternoon tea options too. It’s important to us that we make your time here as productive as we can. When you book a meeting room at SOI you also have access to our complimentary kitchen facilities. It’s just like being in your own office or home office. Help yourself to our tea and coffee facilities for you and your guests. Or grab a quick coffee for yourself between meetings and have a quick break. 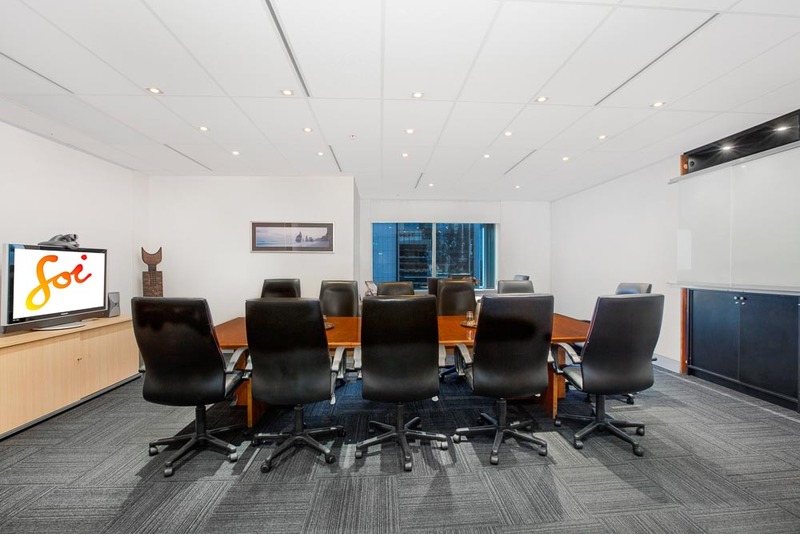 How great would it be to meet your clients in a professional Sydney CBD location? Our office location is only a few minutes walk from Wynyard Station, Barangaroo, King Street Wharf and Darling Harbour. You can’t get better than that! We also have car parking facilities just 5 minutes away. What more could you want from a meeting room venue? 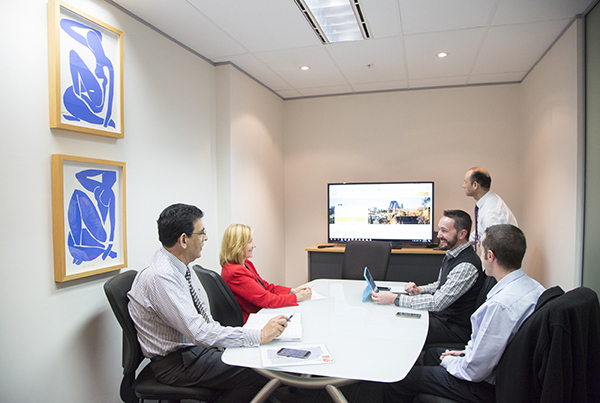 Plus, with our affiliates, we can provide you with meeting room access all around Australia, and even the globe! We believe it’s important to have solutions that meet your needs. And it’s no different when it comes to our meeting room solutions. We offer meeting rooms and boardrooms in varying sizes to suit 2 people through to 60 people. We have a room for you. Also with SOI, you don’t need to pay for a full day. If you are only needing a meeting room for 1 hour or ½ a day, then we can accommodate that. Are You Wowed By Our Meeting Room Hire Benefits? If you find you like using SOI’s meeting room services and the benefits are winning for your business. You might like to take it a step further and explore the other options we have here at SOI – virtual receptionists, serviced offices or our hot desk solutions. Contact us now to discuss your business and how we can help support you.